If you are thinking about investing in precious metals, then you may want to evaluate and compare platinum bullion vs. gold bullion. Both of these metals can make excellent investment choices, but which is better from an investment standpoint? Many investors are buying gold bullion because of the high market prices, but they are overlooking a few factors. Platinum bullion has an even higher market price than gold, and this metal is found in just a few of the many countries around the world. In addition platinum is only found in small amounts in these countries, and the total amount of this metal on earth is small. Silver and gold bullion can be found in almost every area of the world, and these metals do have a limited supply but the amounts are much higher than those for platinum bullion. Right now there is a high demand for most precious metals, because of the weak economy and market uncertainty of the past few years. Precious metals tend to stay stable or increase in value regardless of the economic activity or global situation, and many investors have seen that platinum bars can be a very profitable choice in this sector. Gold bullion prices have risen, but platinum prices have not only kept up but increased more. Because of the high demand and small resources resulting in a low supply, available platinum bullion normally makes a better investment choice than gold bullion weight, especially when you look at the price per ounce. This metal is used in jewelry, manufacturing, and just to invest in and collect. In the future the price of this metal will probably far exceed gold, because there is a lot less platinum bullion available and a greater demand for it. Considered one of the rarest of the precious metals, this bullion has unlimited potential for investors. 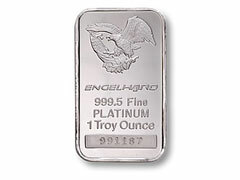 With all the obvious benefits of investing in platinum, there are still some drawbacks. The market for the latter is just not as big as for the yellow precious metal. If you decide to sell your platinum investment, it may be harder to find a buyer down the road. In addition, in situations of economy downfall gold and silver coins are essential for survival purposes for buying basic essentials like food, water and shelter, this might not be the case with platinum. These coins are so high priced that they are just impractical for these purposes.